Scheuermann’s disease, also known as juvenile osteochondrosis, is named after Holger Werfel Scheuermann. The disease is characterized by a structural kyphosis of the thoracic or thoracolumbar spine. The disease can range from mild to a severe life-threatening deformity. Some people have no problems (mild threatening) but others will experience problems such as increasing curved spine, pain, neurological, heart or lung problems. In addition, it has been suggested that between 20 to 30% of patients with Scheuermann’s disease also have scoliosis. In more serious cases, the combination is sometimes known as kyphoscoliosis. First described in 1920, Scheuermann's disease is the most common cause of kyphotic deformity in adolescents. There are two major forms of Scheuermann's kyphosis. The thoracic form is most common and has an apex between T7-T9. 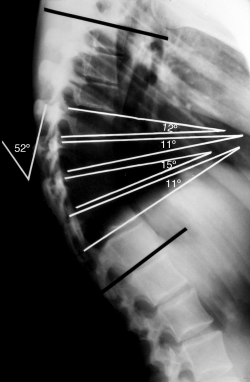 Secondly, the thoracolumbar form can occur with an apex between T10-T12 and is more likely to continue into adulthood. Lumbar kyphosis is also possible; however, it is non-progressive and resolves with rest, activity modification and time. Lumbar kyphosis is associated with repetitive activities involving axial loading of the immature spine. Thus, it is not considered within the scope of this article. The spine of an adult is naturally shaped in an S-curve. The cervical and lumbar regions are concave (lordosis), and the thoracic and sacral regions are convex (kyphosis). According to the Scoliosis Research Society, the thoracic spine has a kyphosis between 20 to 40 degrees. A spinal deformity is considered when the curve is greater (or lesser) as mentioned degrees. Scheuermann’s disease is a structural deformity of the vertebral bodies and spine. The kyphosis of the thoracic region will be around 45 to 75 degrees. Also there will be vertebral wedging greater than five degrees of 3 or more adjacent vertebrae. The wedge shaped bodies characterize the rigid hyperkyphosis we see in Scheuermann’s disease. The hyperkyphosis can be compensated by a lumbar and cervical hyperlordosis. The disease mostly develops during puberty and is seen equally in both sexes. Depending on which criteria is used, 5 to 40% of the population has this anomaly. In the United States the disease occurs in 0,4 to 8 % of the general population . A study by Armbrecht et al. found the prevalence of Scheuermann’s disease in Europe to be 8% in persons aged 50 years and above. Many theories have been proposed for the etiology of Scheuermann's disease, including mechanical, metabolic, and endocrinologic causes, but the real cause is still unclear. According to Sorenson , Scheuermann’s kyphosis is characterized by following criteria. Three or more adjacent vertebrae must be wedged 5° or more and there must be no evidence of congenital, infectious or traumatic disorders of the spine. In severe cases, heart and lung function can be impaired or severe neurological symptoms can occur. These symptoms are extremely rare. Patients with Scheuermann's disease may also complain of inability to participate in physical exercise, work and activities of daily living secondary to pain or the presence of their deformity negatively affecting their cosmetic appearance. Typically, the pain increases with activity and is relieved by rest. The deformity of the spine will be relatively unmovable, unlike in postural kyphosis. It is also possible to see cutaneous skin pigmentation at the area of greatest curvature due to skin friction on chair backs. The possibility of scoliosis must be assessed because of the high association with Scheuermann's disease. Another way to diagnose is with the Drummond’s criterion or Bradford’s criterion. Drummond’s criterion is 2 wedged vertebrae. Bradford’s criterion is ≥ 1 vertebrae wedged ≥ 5°. This criterion leads to earlier diagnosis and treatment which can help minimize deformity. Scoliosis Research Society Instrument (SRSI): This questionnaire can be used for follow- up of an individual to see if the patient reports improvements in level of activity, pain, personal relationships etc. Neurological screening:  rarely the spinal cord can be stretched over the posterior aspect of the vertebral bodies at the apex of the curvature which may cause neurological signs of impending paraplegia with clonus and hyperreflexia. Range of motion: Flexibility of the extremities and spine can identify impairments and track changes over time. According to Lowe, brace treatment is almost always successful in patients with kyphosis between 55 degrees and 80 degrees if the diagnosis is made before skeletal maturity. A greater kyphosis is almost never treated successfully without surgery in symptomatic patients. Other bracing strategies have been attempted such as the use of a soft brace but this however has not shown to be successful. With a soft brace no correction can be achieved in rigid curvatures. Treatment of the Scheuermann's disease depends on the severity and the progression of the disease, the presence or absence of pain and the age of the patient. Scheuermann's disease in adults is regarded to be a different entity from that of the teenager because the major manifestation is pain and not aesthetic quality. The functional rehabilitation on an outpatient basis is the favoured treatment and referral for surgery or dorso-lumbar braces is rare. Correction of breathing: it allows the subject to feel an increased expansion in his/her initially collapsed regions. The goal is to expand the thorax in a back-to-front and a lateral direction. Muscle activation by increasing tension: to achieve the best possible correction, muscle balance, stabilization and to increase the proprioceptive input. It helps to integrate the ‘corrected body schema’ in the brain. Scheuermann's kyphosis can present as a progressive kyphotic deformity with possible pain in adolescents aged 12-17 years. Treatment of the Scheuermann's disease depends on the severity and the progression of the disease, the presence or absence of pain and the age of the patient. Early diagnosis and treatment with bracing or a spinal orthosis can help to stop the kyphotic process and results in permanent correction of vertebral deformity. Physical therapy (Schroth therapy, Principles of Correction of the Barcelona Scoliosis Physical Therapy School, ...) is recommended for postural improvement. Physical therapy can be combined with bracing. More evidence for the efficiency of these therapies is needed. Berdishevsky, Hagit. "Outcome of intensive outpatient rehabilitation and bracing in an adult patient with Scheuermann’s disease evaluated by radiologic imaging—a case report." Scoliosis and spinal disorders 11.2 (2016): 40.